Lou Caimano is an extraordinary saxophonist who has played in the orchestras of top Broadway shows like “Cats,” “A Chorus Line,” and “Evita.” Eric Olsen is an excellent pianist who teaches at Montclair State University and has performed all over the world. Together they are a duet known as Dyad. Both musicians have one foot in the classical world and the other in jazz, so it’s appropriate that their latest project straddles both. Their new album, “Dyad Plays Puccini,” is a wonderful record that answers the question: “What if Puccini was born in the 20th century and, instead of writing operas, he wrote jazz standards?” If this album is any indication he would do it quite successfully. As it turns out, tunes like “Che gelida manina,” “Nessun Dorma,” and “Ch’ella mi creda” swing, “In quelle trine morbide” and “O mio babbino caro” would be beautiful in just about any genre, and “Musetta’s Waltz” is as catchy as a great pop song. No small part of the magic of this album is the brilliance of the playing. Caimano’s gorgeous wailing on the sax is perfectly complemented by Olsen’s perfect touch at the keyboard. But just as important are the arrangements, which leave plenty of room for each musician to stretch out. 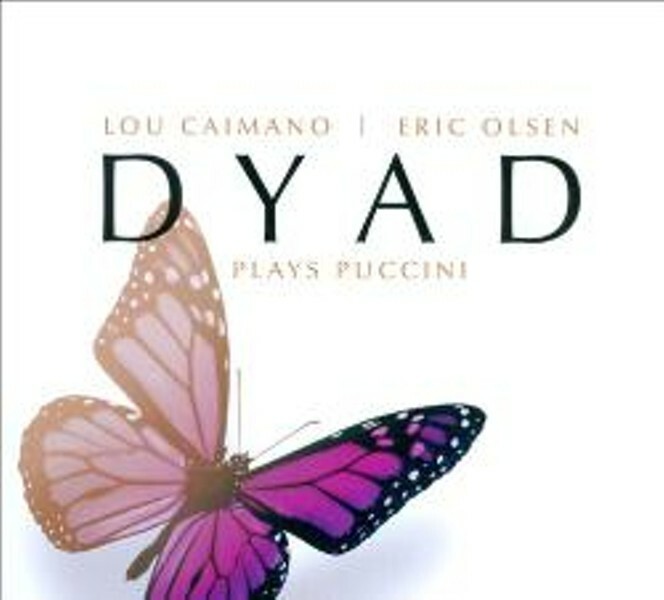 “Dyad Plays Puccini” is chamber jazz at its finest.